You'll be £8.00 closer to your next £10.00 credit when you purchase Medieval Armoured Combat. What's this? The "Gladiatoria" group of German fencing manuscripts are several editions of a treatise on armoured foot combat, specifically aimed at duel fighting. Additional essays discuss other aspects of the manuscript - including a tale of Dierk Hagedorn's adventures tracking down the manuscript. 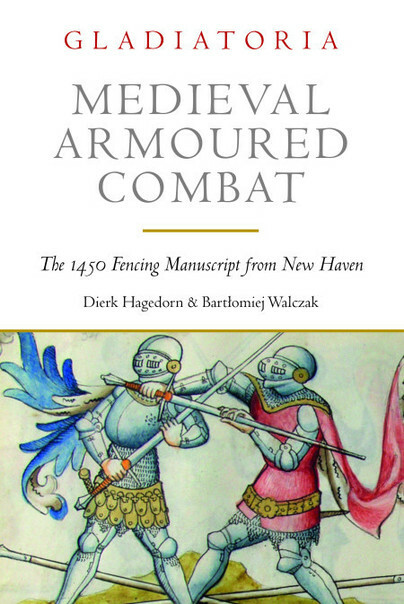 Medieval Armoured Combat will be going to my shelf of favourite history books, and I’m certain that I’ll use it frequently over the next few weeks as reference guide. At the same time magnificent and informative, this book gives a very realistic idea of sword fighting techniques. Dierk Hagedorn was born in 1966 in Hamburg, Germany, and he started sport fencing at the age of nine. He is head instructor of the longsword for Hammaborg Historischer Schwertkampf. He is also a member of HEMAC, the Historical European Martial Arts Coalition, and has transcribed more than a dozen German manuscripts. He is an illustrator, web-designer and lecturer. Bartłomiej Walczak was born in 1978 and has been practising and researching historical martial arts since 1999. He has lectured worldwide, published transcripts, translations and articles and has participated in tournaments, winning the 2015 ILHG Open Longsword. He lives in Poland and works remotely as a software designer for a US-based start-up.